While I’m telling you about my favourite games, I have to reserve a mention for my first ever videogame. 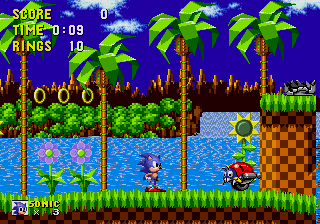 Drum roll please… its the original Sonic the Hedgehog for the Sega Mega Drive/ Genesis. I first played this game when I was about 5 years old, which was in 1998 (already 7 years after the game came out, but I guess being five is a good excuse for not being on the cutting-edge of technology). A friend of my aunts had brought the Mega Drive to her house- being curious about what the strange black box with all the buttons on was, I instantly kept asking if I could play with it. The results were pretty much what you would expect for a five-year-old playing their first ever videogame: I didn’t do very well at all. In fact, I couldn’t even beat Green Hill Zone Act 3 as I kept getting flattened by the wrecking ball. and had to get my aunt to do it for me. So, as much as I loved the colours and how cool it looked, I ended up rage-quitting very quickly. A few years later, I was at the house of one of my friends in primary school, and saw a Mega Drive with the Sonic 1 cartridge in, and thought I’d give it another go. This time it went slightly better (although neither of us could do the special stages very well), until we got to the trick infinite-loop that is Labyrinth Zone. Sonic’s face on the image to your right sums up how we felt about it. Again, a rage-quit was in order. After this, I never really played any platformers- my main focus was the similarly brightly-coloured Guitar Hero series. However, that changed after Sonic Generations was released for the 360. (I hadn’t intended to get the game for myself, but as a Christmas present for a friend: when we exchanged gifts, we discovered that we had both unknowingly bought Generations for each other, which got a lot of laughs). So, I tried it again- and this time I really loved it, and managed to complete the game. It was also my first experience of playing a 3-D Sonic game, which was really confusing at first. Just to make things even cooler, an unlockable extra in Generations is an emulated version of the original Mega Drive game playable within the main game. This meant- in what has to be a record delay between starting a level and finishing it- I could go back and beat the original Green Hill Zone Act 3, 14 years after I first tried to play it.